Everyone loves coffee and there is no better place to go get it than at The Coffee Bar! One of San Pedro’s newest establishments, The Coffee Bar has been fueling this bustling island for the past month. 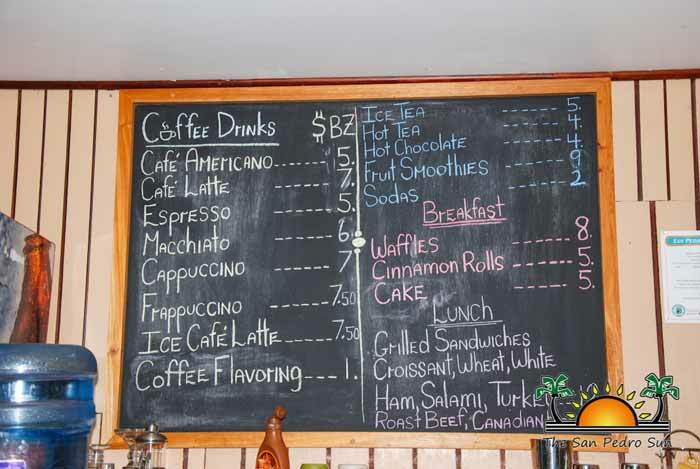 Located in the heart of San Pedro, Barrier Reef Drive to be exact, this place offers a variety of coffee drinks, teas, pastries and even yummy sandwiches and waffles. But The Coffee Bar isn’t all about the drinks, it’s also about the eats! We were treated to fluffy waffles with fresh banana and papaya slices drizzled in syrup. Talk about decadently yummy! You can choose from a selection of croissants, bagels or sandwiches with your choice of ham, salami, turkey, roast beef or bacon. So stop by for a cup of Joe or two and enjoy The Coffee Bar’s many delicious treats. They even have free wifi! Sit inside with comfy AC or enjoy their curbside patio where you can watch the bustling street life pass by. The Coffee Bar is located on Barrier Reef Drive and is open daily from 6AM to 5:30PM.